President Michael D Higgins and his wife Sabina Higgins visited the Campus on Friday May 25 to present Gaisce awards to four young people. The event was a fantastic occasion involving young people and the staff who care for, and guide them through their time in Oberstown. The President gave a passionate speech, and he and his wife spent time speaking to young people and celebrating their achievements with them. 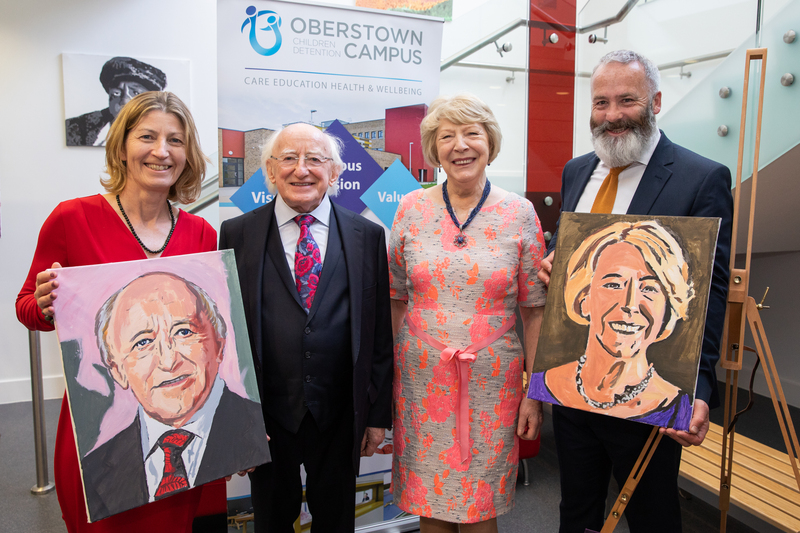 Young people presented the visitors with portraits (see image below of Chair of the Board, Professor Ursula Kilkelly, and Deputy Director of Oberstown, Damien Hernon, with the President, his wife and the portraits), and had their Gaisce certificates signed by the President. The success of the day was the result of team work across the Campus and beyond, and everyone played their part. Find the press release with more information about the President’s Visit here.